For those of you who have already given up hope on your 2015 diets I have a treat for you! Cinnamon Rolls with creamy cream cheese frosting are the perfect morning treat. *For those of you using metric measurements I have the recipe converted for you at the very bottom of the post. I also have Gluten Free options, and regular flour options for those of you who love your gluten 😉 You can also purchase pre made frozen dough at the local market look for frozen pizza dough. Add 1 Tablespoon of the sugar to the warm water. Please be mindful that yeast is a living organism, so if the water is too hot it will die and then your dough won’t rise. Sprinkle the yeast packets on top of the water and let sit for 5 minutes. Cream together the butter in a stand up mixer. Add the eggs one at a time, making sure to blend completely. Add the yeast mixture to the butter/egg mixture and blend. Add in the Gluten Free Flour Blend and Cinnamon; blend for two minuets using your dough hook attachment. Once everything is evenly kneaded in; cover the bowl with a damp cloth and place the bowl in a warm place to rise for 30 mins. Dough should be about 2 times larger. Please keep in mind that Gluten Free Flour blend (this is my favorite and I’m not being paid to say this) is a fickle thing and depending on the blend it may rise more or less. 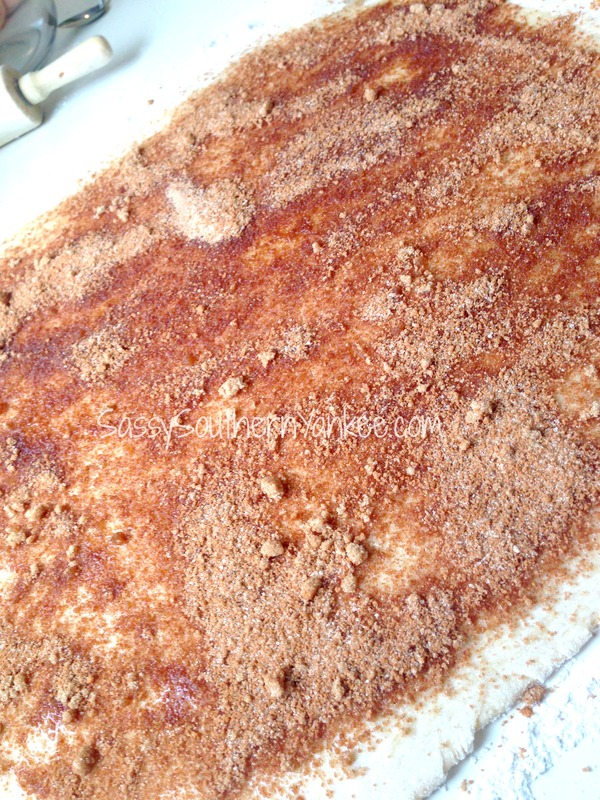 In a large bowl combine the cinnamon, sugar, brown sugar and Vanilla. Melt the butter in a separate bowl or my favorite a coffee mug. Once the dough has had a chance to rise; roll the dough out on a GF floured surface. I like to knead mine a bit then roll it out on the “floured” surface. Roll the dough so that it’s about 1/4 inch thick into a rectangle shape (this doesn’t have to be a work of art just do the best that you can). Once the dough is rolled out; pour the melted butter over the dough and using a pastry brush (or BBQ sauce brush) Spread the butter evenly over the dough. Next sprinkle the cinnamon mixture over the dough from edge to edge. Using your hands start to roll the dough into a log using the long side of the dough. Cut the dough crosswise making each piece about 1/2 inch wide. Place the Cinnamon Rolls into a greased 9X13 pan. Typically this recipe makes about 16-18 rolls for me depending on how my slicing skills are that day. At this point you now have two options. If you can’t wait and you want to eat them right now then set them aside covered with a damp cloth and allow to rise in a warm place for 30 minuets. If you wanted to make them ahead for tomorrows breakfast you can pop them in the fridge covered with some plastic wrap for up to 24 hours. About 1 hour prior to baking remove from the fridge and allow the rolls to come to room temperature and finish their second rise. Bake the Cinnamon Rolls at 375* for 20 minuets or until they puffy and golden brown. For the icing combine the icing sugar, cream cheese, butter with a whisk until smooth. I like to put half of the icing on the rolls right after they come out of the oven; then drizzle the remaining icing over the rolls once they have cooled for 5 minuets. 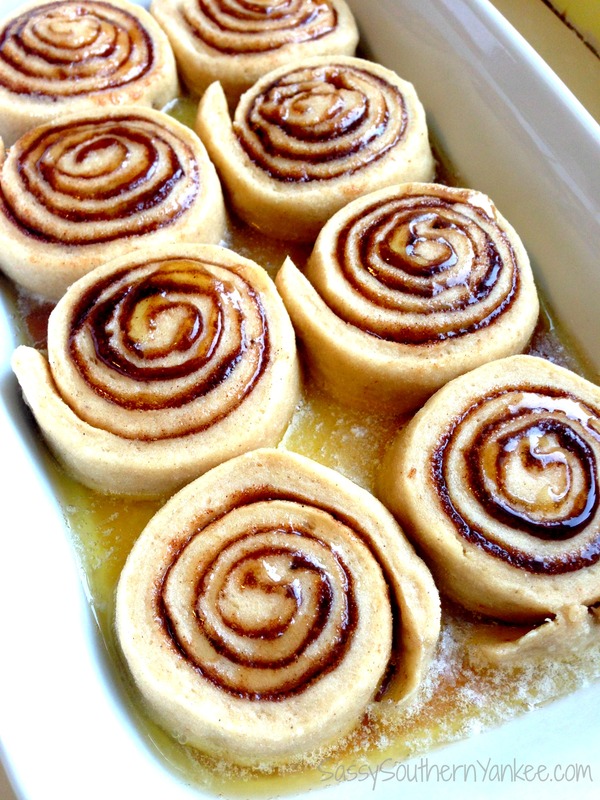 Light, Flaky with creamy frosting these Cinnamon rolls are sure to please. They are Gluten free and can be made in advance for a quick weekend brunch. Add 1 Tablespoon of the sugar to the warm water. Please be mindful that yeast is a living organism, so if the water is too hot it will die and then your dough won't rise. Sprinkle the yeast packets on top of the water and let sit for 5 minutes. Cream together the butter in a stand up mixer. Add the eggs one at a time, making sure to blend completely. Add the yeast mixture to the butter/egg mixture and blend. Add in the Gluten Free Flour Blend and Cinnamon; blend for two minuets using your dough hook attachment. Once everything is evenly kneaded in; cover the bowl with a damp cloth and place the bowl in a warm place to rise for 30 mins. Dough should be about 2 times larger. Please keep in mind that Gluten Free Flour blend (this is my favorite and I'm not being paid to say this) is a fickle thing and depending on the blend it may rise more or less. Once the dough has had a chance to rise; roll the dough out on a GF floured surface. I like to knead mine a bit then roll it out on the "floured" surface. Roll the dough so that it's about ¼ inch thick into a rectangle shape (this doesn't have to be a work of art just do the best that you can). Once the dough is rolled out; pour the melted butter over the dough and using a pastry brush (or BBQ sauce brush) Spread the butter evenly over the dough. Next sprinkle the cinnamon mixture over the dough from edge to edge. Using your hands start to roll the dough into a log using the long side of the dough. Cut the dough crosswise making each piece about ½ inch wide. Place the Cinnamon Rolls into a greased 9X13 pan. 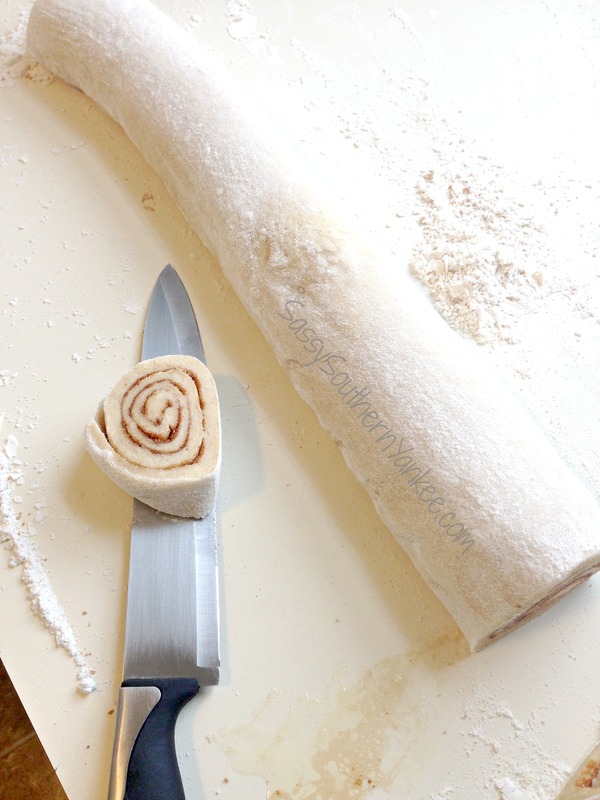 Typically this recipe makes about 16-18 rolls for me depending on how my slicing skills are that day. At this point you now have two options. If you can't wait and you want to eat them aside covered with a damp cloth and allow to rise in a warm place for 30 minuets. If you wanted to make them ahead for tomorrows breakfast you can pop them in the fridge covered with some plastic wrap for up to 24 hours. About 1 hour prior to baking remove from the fridge and allow the rolls to come to room temperature and finish their second rise. 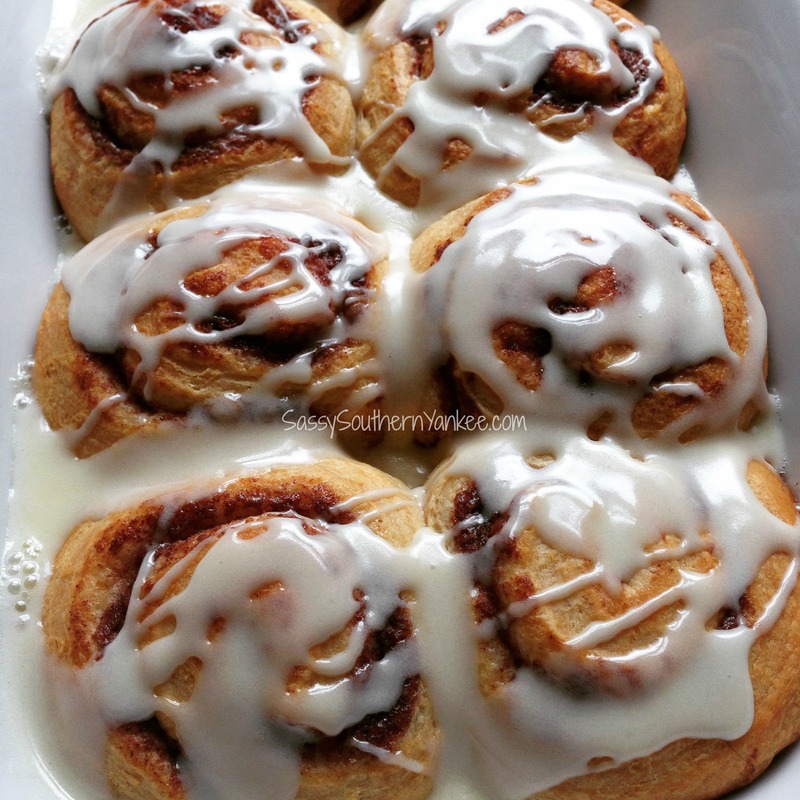 This entry was posted in Breakfast and tagged Australia, Breakfast, Brunch, Bun in the oven, Cinnabon Copycat, Cinnabun, Cinnamon, cinnamon rolls, Cinnamon Scrolls, Cream Cheese, Frosting, Gluten Free, Metric Recipe, Weekend.